Background: The leaves of Alpinia zerumbet var. excelsa (alpinia) are used to prepare traditional food items and folk medicines. Objective: This study was designed with a view to explore the anti-inflammatory and anti-melanogenic potentials of major components of alpinia leaves. Materials and Methods: Anti-inflammatory effects of leaf-derived compounds were primarily assessed with protein denaturation and proteinase assay. Their inhibitory effects on nitrite accumulation and prostaglandin E2 (PGE2) production in lipopolysaccharide-induced RAW 264.7 cells were also evaluated. For anti-melanogenic assays, all the compounds were tested on α-melanocyte-stimulating hormone-stimulated B16F10 cells and on mushroom tyrosinase in vitro. Their cytotoxicity was evaluated using fibroblast cell line 3T3 L-1 and brine shrimps. Results: Five compounds, 5,6-dehydrokawain, dihydro-5,6-dehydrokawain, (E)-5-methoxy-8-(4-methoxy-2-oxo-2H-pyran-6-yl)-7-phenyl-1-styryl-2-oxabicyclo[4.2.0]oct-4-en-3-one (AS-2), kaempferol 3-O-β-D-glucuronide (KOG), and quercetin 3-O-β-D-glucuronide (QOG) were purified from the leaves. Of which, AS-2 and QOG were purified for the first time. All compounds significantly inhibited albumin denaturation and proteinase activity. AS-2, KOG, and QOG remarkably inhibited nitric oxide formation with IC50 values of 8.2, 13.3, and 12.6 μM, respectively, in RAW 264.7 cells. They also inhibited PGE2 production with IC50 values 19.8-23.7 μM. They showed anti-melanogenic effects reducing tyrosinase activity (IC50 values 29.6-112.5 μM) and melanin formation (IC50 values 30.8–164.4 μM) in B16F10 cells, and inhibiting mushroom tyrosinase (IC50 values 61.5-456.4 μg/ml). Conclusion: Taken together, major components of alpinia leaf could be utilized as a potent herbal drug and food supplement with therapeutic prospects against inflammatory disorders and hyperpigmentation. Abbreviations used: HPLC: High performance liquid chromatography; DK: 5,6-dehydrokawain; DDK: Dihydro-5,6-dehydrokawain; AS-2: (E)-5-methoxy-8-(4-methoxy-2-oxo-2H-pyran-6-yl)-7-phenyl-1-styryl-2-oxabicyclo[4.2.0]oct-4-en-3-one; KOG: Kaempferol 3-O-β-D-glucuronide; QOG: Quercetin 3-O-β-D-glucuronide; PGE2: Prostaglandin E2; PAK1: RAC/CDC42-activated kinase 1; UV: Ultra violet; α-MSH: α-Melanocyte-stimulating hormone; COX-2: Cyclooxygenase-2; iNOS: Inducible Nitric Oxide Synthase; PDGF: Platelet Derived Growth Factor; MITF: Microphthalmia-Associated Transcription Factor; TRP: Tyrosinase Related Protein; ATCC: American Type Culture Collection; DMEM: Dulbecco's Modified Eagle Medium; FBS: Fetal bovine serum; CS: Newborn calf serum; MTT: 3-(4,5-dimethylthiazol-2-yl)-2,5-diphenyl-tetrazolium bromide; DMSO: Dimethyl sulfoxide; NO: Nitric oxide; LPS: Lipopolysaccharide; DMRT: Duncan's multiple range test; SPSS: Statistical Package for the Social Sciences. In the present study, we have purified five major compounds from alpinia leaves and described their anti-inflammatory and melanogenesis inhibitory effects in vitro. Two compounds were purified for the first time from this plant. They all were found to have significant inhibitory effects on inflammation and melanogenesis. These effects might be attributed to their RAC/CDC42-activated kinase 1 blocking properties. Moreover, these compounds are not cytotoxic to the normal cells and to the small animal model brine shrimps. Hence, alpinia leaves could be a good choice for developing non-toxic herbal drug to treat inflammatory disorders and skin-hyperpigmentation. Inflammation is nowadays implicated as one of the important pathophysiological mechanisms underlying several diseases or disorders including diabetes, cardiovascular diseases, cancer, arthritis, neurodegenerative diseases, and autoimmune diseases. Chronic inflammation is thought to be one of the major triggering factors for several pigmentary disorders., In post-inflammatory sites on the skin, hyperpigmentation occurs mainly due to high accumulation of histamine and arachidonic acid metabolites. Prostaglandin E2 (PGE2) is also found to be increased in inflamed skin regions. These all are termed as inflammatory mediators which accelerate melanin production in melanocytes and transfer the melanin pigments to the neighboring keratinocytes. Moreover, ultraviolet (UV) radiation, a major factor for skin hyperpigmentation, also causes inflammation through releasing inflammatory mediators, and thus, it causes photoaging, hyperpigmentation, wrinkles, and loss of skin firmness and flexibility. Recently, an oncogenic/aging kinase RAC/CDC42-activated kinase 1 (PAK1) has been reported to be a key factor for inflammation and melanogenic signaling pathways., As a downstream effector, PAK1 activates cyclooxygenase-2 (COX-2), and inducible nitric oxide synthase (iNOS) and regulates the pathways involved in pain and inflammation., In the melanogenic pathway, it is activated by the major growth hormone platelet-derived growth factor, which in turn activates beta-catenin and microphthalmia-associated transcription factor. They induce the expression of tyrosinase and tyrosinase-related protein genes essential for melanin formation. Therefore, PAK1 blocking components might be effective for inhibiting inflammation and melanogenesis, and they could be a good therapeutic choice for treating inflammation, skin hyperpigmentation, and other inflammatory disorders as well. Alpinia zerumbet is a perennial zingiberous plant, which is widely distributed in subtropical and tropical regions worldwide. Two varieties of this plant, tairin (A. zerumbet (Pers.) B. L. Burtt and R. M. Sm. var. excelsa Funak and T. Y. Ito) and shima (A. zerumbet (Pers.) B. L. Burtt and R. M. Sm. ), are found in Okinawa, Japan, and they differ from each other with their morphological features and biological activities. Tairin variety is found to be grown there in abundant. However, leaves from both varieties are conventionally used there to prepare rice cakes, herbal teas, and to flavor the noodles. Japanese people also prepare leaf decoctions from A. zerumbet for treating fever and the common cold., This plant was investigated for its pharmacological benefits against obesity, diabetic, hypertension, and atherosclerosis,,,, but no studies have examined yet on its anti-inflammatory effects. Moreover, the phytochemicals isolated from this plant were reported to have PAK1 blocking activities.,, Hence, we predicted that it might have inhibitory effects on inflammatory disorders, and this study was undertaken to investigate the anti-inflammatory and anti-melanogenic effects of major leaf components of A. zerumbet var. excelsa (alpinia). Murine macrophage cell line (RAW 264.7) and melanoma cell line (B16F10) (American Type Culture Collection [ATCC], Manassas, Virginia, USA) were cultured in Dulbecco's modified eagle medium (DMEM, Sigma-Aldrich, Saint Louis, Missouri, USA) supplemented with 10% fetal bovine serum (FBS, HyClone, Victoria, Australia) and 1% penicillin/streptomycin (10,000 U/ml and 100 μg/ml) at 37°C in a humidified atmosphere containing 5% CO2. The mouse embryonic fibroblast cell line 3T3-L1 (ATCC) was cultured in the same conditions using 10% newborn calf serum (CS, HyClone, Victoria, Australia) instead of FBS. DMEM without phenol red was purchased from Thermo Fisher Scientific (Massachusetts, USA). Casein, Griess reagents, 70% perchloric acid, and 3-(4,5-dimethylthiazol-2-yl)-2,5-diphenyl-tetrazolium bromide (MTT) were purchased from Sigma-Aldrich. Chicken egg albumin and trypsin were purchased from Funakoshi Co. Ltd. (Tokyo, Japan). All other chemicals and reagents used in this study were of analytical grade and obtained from either Wako Pure Chemical Industries Ltd. (Osaka, Japan) or Kanto Chemical Co. Inc., (Tokyo, Japan). Alpinia leaves were collected from the field of Subtropical Field Science Center, University of the Ryukyus, Okinawa, Japan. The plant material was identified by Prof. Shinkichi Tawata, and the voucher specimens (PRC-2016-01) are stored at PAK Research Center, University of the Ryukyus. The materials were collected in a plastic bag and used in the extraction process soon after the collection. Fresh leaves were cut into small pieces and washed with tap water. The leaves were then kept at room temperature for 24 h and placed into an oven at 45°C for 48 h. The dried leaves were then used to make a powder using a kitchen blender. Approximately 30 g of leaf powder was soaked in 400 ml acetone for 48 h, and then the extracts were collected through filtration. Extraction was performed twice, and following that, the solvent was evaporated with reduced pressure at 4°C temperature using a rotary evaporator. Dried extracts were dissolved in water (200 ml), then partitioned with ethyl acetate, and the final 940.1 mg (3.13%) of ethyl acetate extract was collected. The ethyl acetate extract was subjected to high-performance liquid chromatography (HPLC) using a semi-preparative C18 column (Inertrsil ODS-3, 250 mm × 10 mm, GL Sciences Inc., Tokyo, Japan), and three compounds: 5,6-dehydrokawain (DK), dihydro-5,6-dehydrokawain (DDK), and (E)-5-methoxy-8-(4-methoxy-2-oxo-2H-pyran-6-yl)-7-phenyl-1-styryl-2-oxabicyclo[4.2.0]oct-4-en-3-one (AS-2) [Figure 1]a,[Figure 1]b,[Figure 1]c were purified. Water (solvent A) and methanol (solvent B) were used as mobile phases with a flow rate of 2.5 ml/min. HPLC conditions were as follows: 0–44 min, 60% solvent B; 0-30 min, 75% solvent B; 30.01–37 min, 100% solvent B; and 37.01–44 min, 60% solvent B. Fresh leaves (250 g) were directly placed into 500 ml boiling water, extracted for 15 min, and then the extract was cooled at room temperature. The extract was then filtered and partitioned with n-hexane, dichloromethane, and chloroform. Afterward, the extract was fractioned continuously with ethyl acetate and butanol to produce a crude extract (ALEB). The ALEB extract was chromatographed with Sephadex LH-20 (GE Healthcare Life Sciences) with ethanol/acetone gradient elution to yield two fractions. Fraction 1 was subjected to preparative thin-layer chromatography with butanol/acetic acid/water solvent (6:1:2). Kaempferol 3-O-β-D-glucuronide (KOG) and quercetin 3-O-β-D-glucuronide (QOG) [Figure 1]d and [Figure 1]e were purified through HPLC using a mobile phase of 0.1% acetic acid in distilled water (solvent A) and 0.1% acetic acid in methanol (solvent B). The gradient elution was performed as follows: 0–27 min, 10% solvent B; 27–30 min, 90% solvent B. Cell viability for B16F10, RAW 264.7, and 3T3-L1 cells were evaluated through MTT assay. Briefly, all the cells were seeded in 48-well plates for 24 h. B16F10 cells were seeded with a density of 1 × 104 cells/well, whereas RAW 264.7 and 3T3-L1 cells were seeded with a density of 1 × 105 cells/well. The culture medium was then replaced with fresh medium containing various sample concentrations. Indomethacin was used as control in Raw 264.7 cells, whereas kojic acid was used as control in B16F10 cells. Both indomethacin and kojic acid were used as negative control in 3T3-L1 cell culture. After adding the samples with desired concentrations, RAW 264.7 cells were incubated for 24 h, while B16F10 and 3T3-L1 cells were incubated for 48 h. The supernatant was then removed and aliquots of 100 μl MTT solution (0.5 mg/ml in phosphate buffer saline [PBS]) were added to each well, and the plate was incubated again at 37°C for 3 h in humidified conditions supplemented with 5% CO2. After 3 h, 500 μl of DMSO was added to each well, and the plate was shaken for 30 min to dissolve the formazan crystals. Finally, the absorbance was measured at 570 nm wavelength and cell viability was calculated from the absorbance of treated versus untreated cells. Where, A = absorbance of the test sample, and B = absorbance of the negative control. It was done according to the method described by Govindappa et al. The reaction mixture (2 ml) was consisting of 0.08 mg trypsin, 1 ml of 20 mM Tris hydrochloric acid buffer (pH 7.4) and 1 ml of test compounds at desired concentrations. The mixture was then incubated at 37°C for 5 min. After that, 0.8% (w/v) casein (1 ml) was added and the mixture was incubated for additional 20 min. A volume of 1 ml of 70% perchloric acid was added to terminate the reaction. Finally, the reaction mixture was centrifuged, and the absorbance of supernatant was measured at 210 nm. The experiment was performed twice in triplicate. The percentage inhibition of proteinase inhibitory activity was calculated by using the following formula. RAW 264.7 cells were seeded in 24-well plates with a density of 2 × 105 cells/well for 24 h at 37°C in humidified conditions supplemented with 5% CO2. After aspirating the medium, 400 μl DMEM (without phenol red) containing 10% FBS and 1% penicillin/streptomycin was added to each well. Cells were incubated for 24 h with lipopolysaccharide (LPS) (500 ng/ml final concentration) and various concentrations of the test compounds. Indomethacin at 100 μM concentration was used as a positive control. Nitrite accumulation in each well was determined using the Griess reagent. The culture supernatant (100 μl) was mixed with equal volumes of Griess reagent and incubated for 10 min at room temperature. The absorbance was recorded at a wavelength of 540 nm and compared to the standard curve prepared using a series of known concentrations of sodium nitrite. PGE2 is one of the major inflammatory mediators produced following COX-2 activation. RAW 264.7 cells (2 × 105 cells/well) were seeded in 24-well plates for 24 h. Cells were then treated with LPS (500 ng/ml) and different concentrations of the test compounds for 24 h. Indomethacin at 10 μM concentration was used here as a positive control. The PGE2 levels were determined in the culture supernatant using a PGE2 enzyme-linked immunosorbent assay kit (Cayman Chemical Co., Ann Arbor, Michigan, USA) according to the manufacturer's instructions. Absorbance was measured at 450 nm with a microplate reader. In vitro melanin content was measured according to a method described previously. In brief, the B16F10 melanoma cells were seeded with a density of 2 × 104 cells/well in 24-well plates and incubated overnight. The cells were then exposed to various sample concentrations for 48 h in the presence of 100 nM α-melanocyte stimulating hormone (α-MSH). Then, the cells were washed twice with PBS and lyzed with 400 μl of 1 N NaOH containing 10% DMSO and incubated for 1 h at 80°C. The optical density of the mixed homogenate was measured at a wavelength of 405 nm using a microplate reader. The rates of melanin inhibition in the treatment groups were calculated in comparison to the control group. Intracellular tyrosinase activity in B16F10 cells was measured with a modified way of a previous method. Cells were seeded at a density of 2 × 104 cells/well in 24-well plates for 24 h and exposed to different sample concentrations for 48 h in the presence of 100 nM α-MSH. The cells were then washed with ice-cold PBS and lyzed with 500 μl of phosphate buffer containing 1% TritonX and then frozen at −80°C for 30 min. After thawing and mixing, 100 μl of 0.5% L-DOPA was added to each well. Following incubation at 37°C for 2 h, the absorbance was measured at 492 nm wavelength. Intracellular tyrosinase activity was calculated in comparison to the α-MSH treated control group. Tyrosinase inhibition (%) = ([A − B]−[C − D])/(A − B) ×100, where A is the absorbance of the control with the enzyme, B is the absorbance of the control without the enzyme, C is the absorbance of the test sample with the enzyme, and D is the absorbance of the test sample without the enzyme. Toxicity of different compounds were evaluated with brine shrimp (Artemia salina) toxicity assay. Briefly, 200 mg of dried brine shrimp eggs (Tetra Brine Shrimp Eggs, Spectrum Brands Holdings, Inc., Kanagawa, Japan) was hatched in artificial seawater supplemented with dried yeast with suitable aeration at 28°C in room conditions for 48 h. Then, active nauplii were transferred to a glass petri dish-containing artificial seawater. Samples were primarily dissolved in DMSO and then diluted with artificial seawater. Samples were added to each well (12–15 larvae per well in 100 μl artificial seawater), and then the well plate was kept at 20°C. The final concentration of DMSO was 1% (v/v), and DMSO at 1% was used in the control wells. After 48 h of incubation, the number of dead larvae in each well was counted using magnifying lenses (5× or 10×). Methanol (50 μl) was then added to each well, and the total number of larvae in each well was counted after 1 h. The percentage of viability for each well was then calculated. Data are expressed as the mean ± standard error of the mean. Data were analyzed by paired Student's t test with P < 0.05 and P < 0.01 indicating significance. However, Duncan's multiple range test was carried out using IBM SPSS Statistics 24 (IBM Corporation, Armonk, NY, USA) at 5% probability level. External stimuli such as strong acid or base, inorganic salt, organic solvent or thermal treatment denature the proteins structurally, and in turn proteins are failed to explore their biological potency., Denatured proteins are one of the major causes of inflammation, rheumatic disorders, cataract, and Alzheimer's disease., Moreover, proteinases secreted from the neutrophils and leukocytes at inflammatory site may cause tissue damage and further inflammation, and proteinase inhibitors are thought to be effective for significant level of tissue protection., Herein, we studied alpinia leaf derived compounds against protein denaturation and proteinase activity in vitro. We found that all the compounds exhibited potential inhibitory effects on both protein denaturation and proteinase activity in dose-dependent manner [Figure 2]a and [Figure 2]b. DDK showed significant inhibition on egg albumin denaturation with IC50 value of 14.5 μM, whereas the IC50 values for DK, AS-2, KOG, and QOG were 14.9, 25.5, 25.4, and 20.4 μM. On the other hand, DK showed stronger proteinase inhibitory activity with IC50 value 39.9 μM followed by DDK, AS-2, QOG, and KOG (IC50 values are 43.8, 44.5, 56.6, and 63.2 μM, respectively). All the compounds were found to be more effective in both protein inhibition assay and proteinase assay compared to the positive control, diclofenac sodium (IC50 values are 94.6 and 113.3 μg/ml, respectively). These findings, therefore, reveal the prospect of alpinia leaf components to be further studied against inflammation using another model and developed into effective pharmaceutical agents as well. Inflammatory mediators such as nitric oxide (NO), cytokines, chemokines and eicosanoids are produced during inflammation for generating a series of protective responses. NO is considered to be a major pro-inflammatory agent which is involved in other diseases including asthma, rheumatoid arthritis, and atherosclerosis. Similarly, PGE2 is another well-studied pro-inflammatory mediator which contributes to the development of the cardinal signs of acute inflammation through redness, swelling, and pain. Nowadays, NO and PGE2 inhibition have been revealed as an effective treatment option for inflammation and related disorders., In this study, we tested the effects of purified compounds on formation of NO and PGE2 in RAW 264.7 cells following LPS-induced inflammation. Firstly, all the compounds were evaluated for their effects on RAW 264.7 cell viability through MTT assay. It was revealed that the compounds did not show cytotoxicity on RAW 264.7 cells, whereas they showed a degree of cell proliferation at specific concentrations [Figure 3]a, suggesting that pro-proliferative activity in RAW 264.7 cells. Therefore, the nontoxic concentrations of the five compounds were used in the subsequent experiments to determine their effects on NO and PGE2 formation. We measured the amount of NO in culture supernatants of LPS-induced RAW 264.7 cells in the presence or absence of each compound. 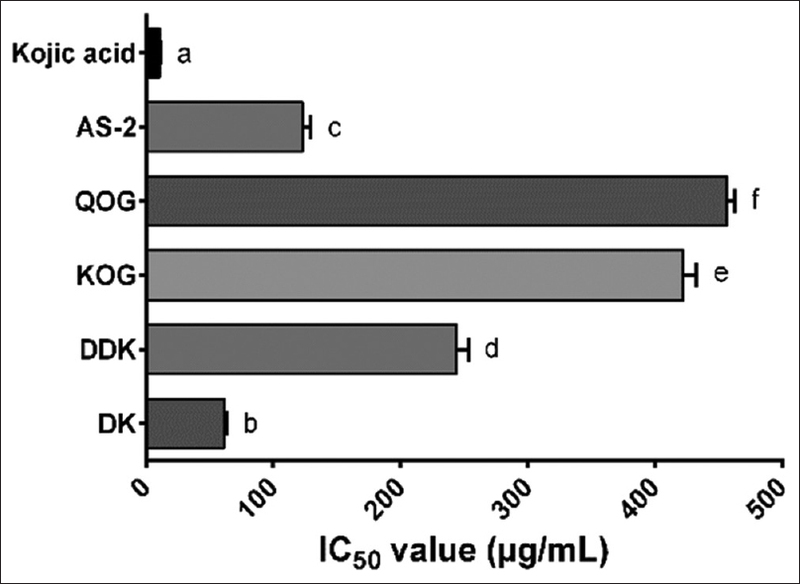 All the compounds inhibited NO production in a concentration-dependent manner [Figure 4]a. DK and DDK showed moderate inhibitory effects (IC50 values-27.6 and 28.1 μM, respectively), whereas KOG and QOG showed stronger inhibition (IC50 values-13.2 and 12.5 μM, respectively) on NO formation. However, AS-2 showed superior performance to all other compounds with IC50 value 8.2 μM against NO production. Next, we measured PGE2 after treating the cells with different compounds at the indicated concentrations. PGE2 production was found to be gradually decreased with the increasing concentrations of the compounds compared to the LPS-stimulated control cells [Figure 4]b. AS-2, KOG, and QOG showed significant effects, whereas DK and DDK were found to be less potent with regard to PGE2 inhibition. The IC50 concentrations for PGE2 inhibition by DK, DDK, AS-2, KOG, and QOG were 69.6, 92.4, 19.8, 22.7, and 23.7 μM, respectively. AS-2 showed the highest anti-inflammatory effects compared to all other tested compounds, inhibiting both NO and PGE2 significantly. In LPS-treated macrophages, NO and PGE2 are produced from L-arginine and arachidonic acid, respectively, and these reactions are catalyzed by transcriptional activation of iNOS and COX-2 gene, respectively., Therefore, inhibition of NO and PGE2 production by alpinia leaf compounds might be attributed to their downregulatory effects on iNOS and COX-2 activity. This notion warrants further research to explore the molecular mechanisms associated with the anti-inflammatory activities of alpinia leaf-derived compounds. Overproduction and subsequent accumulation of melanin (hyperpigmentation) cause several aesthetic problems such as freckles, age spots, melanoderma, and senile lentigo. Melanin biosynthesis (melanogenesis) is mostly regulated by the rate limiting enzyme tyrosinase. During melanogenesis, reactive oxidants including hydrogen peroxide (H2O2) and reactive oxygen species (ROS) are produced, causing oxidative stress in melanocytes. This oxidative stress subsequently leads to chronic inflammation, which in turn could mediate skin hyperpigmentation and cancer. 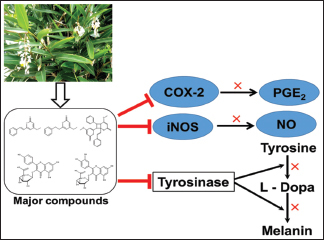 As alpinia leaf compounds exhibited anti-inflammatory actions, we hypothesized that they would also exhibit anti-melanogenic potential through inhibition of tyrosinase activity and decreasing melanin content in B16F10 cells. They were found to be non-toxic to B16F10 cells [Table 1] and therefore, used at 10, 20, 50, and 100 μM concentrations to assess their anti-melanogenic effects. As shown in [Table 1], all the compounds reduced melanin content dose-dependently. Of the five compounds tested, AS-2, KOG, and QOG were found to be more potent in inhibiting cellular melanin content with IC50 values of 30.8, 72.6, and 63.1 μM, respectively. In contrast, the apparent IC50 values for DK and DDK were calculated 164.4 and 139.4 μM, respectively. 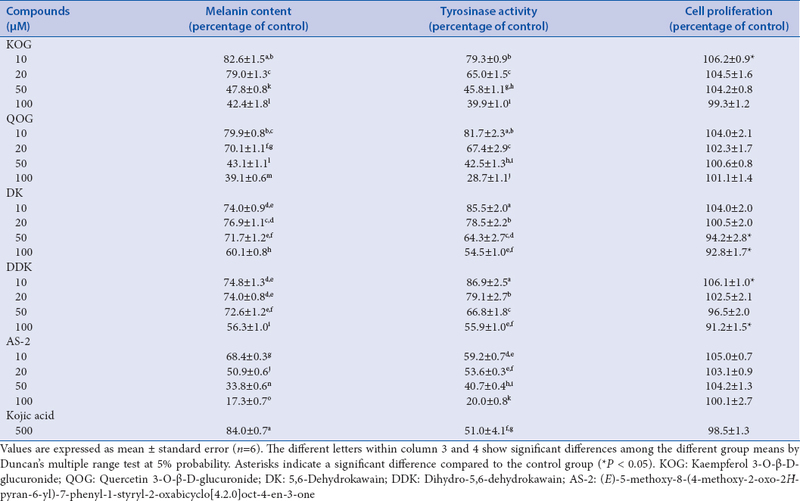 Furthermore, all the compounds downregulated intracellular tyrosinase activity as shown in [Table 1]. AS-2, KOG, and QOG demonstrated superior inhibitory action on the tyrosinase enzyme with IC50 values of 29.6, 63.6, and 54.0 μM, respectively. DK and DDK also inhibited cellular tyrosinase with IC50 values of 106.9 and 112.5 μM, respectively. In this study, AS-2, KOG, and QOG showed the highest anti-melanogenic effects without interfering with the viability of B16F10 cells. They also inhibited mushroom tyrosinase activity in vitro[Figure 5]. Of these, DK showed stronger effects on mushroom tyrosinase with IC50 value of 61.5 μg/ml, whereas the IC50 values for DDK, KOG, QOG, and AS-2 are 243.9, 422.2, 456.4, and 123.1 μg/ml, respectively. All the compounds showed weak inhibitory effects on mushroom tyrosinase compared to their inhibition on cellular tyrosinase. For the screening of potential skin-whitening agents, tyrosinase activity evaluation is thought to be important, and the cellular tyrosinase assay is a more reliable assay than the cell-free mushroom tyrosinase assay in this regard. However, mushroom tyrosinase is found in the cytosol while tyrosinase in melanocytes is membrane bound, that's why anti-tyrosinase effects of alpinia compounds on these tyrosinases may not be the same. Since toxicity is the major concern to use natural compounds for medicinal/food purposes, we here tested alpinia leaf components on 3T3-L1 fibroblast cells and on brine shrimps. The brine shrimp is a small animal that is widely used as a model to determine the toxicity of heavy metals, pesticides and plant extracts/compounds. The effects of different compounds on brine shrimps and on 3T3-L1 cells after 48 h of incubation are shown in [Figure 3]b and [Figure 3]c. DK at ≥100 μM concentration showed toxic effects on brine shrimps, whereas all other compounds at tested concentrations were found to be nontoxic. They also did not show cytotoxic effects on 3T3-L1 cells compared to the control. However, DK and DDK showed pro-proliferative effects on 3T3-L1 cells increasing the cell proliferation significantly. On the other hand, kojic acid and indomethacin at 100 μM concentration showed significant cytotoxicity on both 3T3-L1 cells and on brine shrimps. These results indicate that alpinia compounds could be used as a safe natural therapeutic source. From this study, we found that alpinia leaf components inhibit tyrosinase enzyme and eventually reduce melanin content in B16F10 cell culture. They also inhibit tyrosinase enzyme activity in vitro. In addition, these compounds inhibit PGE2 production and NO formation in RAW 264.7 cells, which might be due to their down-regulating effects on COX-2 and iNOS gene expression, respectively. Previously, our group concentrated on direct PAK1 inhibitory effects of alpinia compounds, and confirmed that DK, DDK, labdadiene (12-labdadiene-15,16-dial), MTD ((1E,3E,5E)-6-methoxyhexa-1, 3, 5-trien-1-yl)-2,5-dihydrofuran), TMOQ ((E)-2, 2, 3, 3-Tetramethyl-8-methylene-7-(oct-6-en-1-yl) octahydro-1H-quinolizine), and KOG directly inhibit PAK1 in vitro with the IC50 values of 17, 10.3, 52.1, 58.6, 49.3, and 39.3 μM, respectively.,, Out of all compounds, DK and DDK showed the highest PAK1 blocking activities, which are due to the presence of α-pyrone ring and methoxy group in their structure. However, AS-2 contains more α-pyrone ring and methoxy group in their structure than that of DK and DDK. On the other hand, chemical structure of QOG and KOG are quite similar. We, therefore, can hypothesize that AS-2 and QOG may also inhibit PAK1 directly, although we are currently testing their in vitro PAK1 blocking effects. 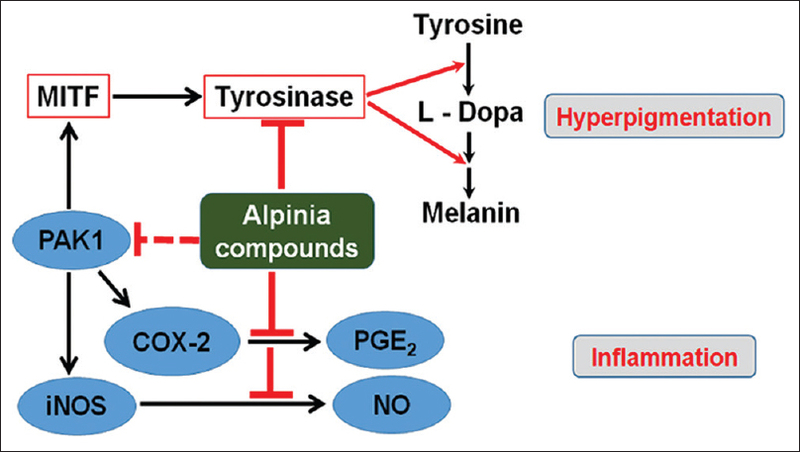 Taking the present study and the previous report of PAK1 blocking effects of alpinia compounds into account, we here propose the possible pathways on their anti-melanogenic and anti-inflammatory actions based on Song et al., Nguyen et al., and Maruta et al. [Figure 6]. Their anti-melanogenic effects might be induced in two different ways-direct inhibition of tyrosinase enzyme activity or down-regulation of tyrosinase enzyme through blocking its downstream effector PAK1. Similarly, their inhibition on PGE2 and NO formation could be due to their PAK1 blocking effects and eventual down-regulation of COX-2 and iNOS activity. These proposed actions of alpinia leaf compounds could be further confirmed using molecular biology study in combination with molecular modeling techniques. We have found that the major compounds of alpinia leaves have considerable inhibitory effects on both inflammatory and melanogenic pathways. Importantly, this dual inhibitory action is reported here for the first time. All the compounds exhibited anti-inflammatory activities through inhibiting protein denaturation, proteinase activity, and the formation of inflammatory mediators-NO and PGE2. They also inhibited cellular tyrosinase activity and melanin formation in cultured B16F10 cells, and mushroom tyrosinase activity in vitro demonstrating their anti-melanogenic potentials. These compounds can inhibit PAK1, a downstream effector of inflammatory and melanogenic signaling cascades, and hence, their anti-inflammatory and anti-melanogenic effects are thought to be attributed to their PAK1 blocking activities. In addition, all the compounds were found to be non-toxic to the brine shrimps, 3T3-L1 cells, B16F10 cells, and RAW 264.7 cells. In conclusion, alpinia leaf components can function as a source for potent and safe natural therapies to treat inflammation and hyperpigmentation, and the leaves could be commercially utilized to develop herbal supplements as well as value-added foodstuffs. The authors sincerely acknowledge the grant and laboratory facilities from Biosystem Consulting Ltd. Co. (Okinawa, Japan). Lee KK, Choi JD. The effects of Areca catechu L extract on anti-aging. Int J Cosmet Sci 1999;21:285-95. Tomita Y, Maeda K, Tagami H. Mechanisms for hyperpigmentation in postinflammatory pigmentation, urticaria pigmentosa and sunburn. Dermatologica 1989;179 Suppl 1:49-53. Zasada M, Dębowska R, Pasikowska M, Ostrowska B, Budzisz E. Efficacy of tri-active brightening and anti-aging complex in treatment of facial skin hyperpigmentation. J Pharm Pharmacol 2016;4:564-73. Brenner M, Hearing VJ. The protective role of melanin against UV damage in human skin. Photochem Photobiol 2008;84:539-49. Song YS, Park EH, Hur GM, Ryu YS, Lee YS, Lee JY, et al. Caffeic acid phenethyl ester inhibits nitric oxide synthase gene expression and enzyme activity. Cancer Lett 2002;175:53-61. Nguyen BC, Takahashi H, Uto Y, Shahinozzaman MD, Tawata S, Maruta H. 1,2,3-Triazolyl ester of Ketorolac: A “Click Chemistry”-based highly potent PAK1-blocking cancer-killer. Eur J Med Chem 2017;126:270-6. Maruta H, Be-Tu PT, Mok-Ryeon A. Natural or synthetic ant-melanogenic compounds that block the PDGFR-EGFR-PAK1-MITF-Tyrosinase signaling pathway. J Dermatol Res Ther 2017;3:48. Tu PT, Tawata S. Anti-oxidant, anti-aging, and anti-melanogenic properties of the essential oils from two varieties of Alpinia zerumbet. Molecules 2015;20:16723-40. Chan EW, Lim YY, Wong SK, Lim KK, Tan SP, Lianto FS, et al. Effects of different drying methods on the antioxidant properties of leaves and tea of ginger species. Food Chem 2009;113:166-72. Tawata S, Fukuta M, Xuan TD, Deba F. Total utilization of tropical plants Leucaena leucocephala and Alpinia zerumbet. J Pestic Sci 2008;33:40-3. Tu PT, Tawata S. Anti-obesity effects of hispidin and Alpinia zerumbet bioactives in 3T3-L1 adipocytes. Molecules 2014;19:16656-71.
da Cunha GH, de Moraes MO, Fechine FV, Frota Bezerra FA, Silveira ER, Canuto KM, et al. Vasorelaxant and antihypertensive effects of methanolic fraction of the essential oil of Alpinia zerumbet. Vascul Pharmacol 2013;58:337-45. Chompoo J, Upadhyay A, Gima S, Fukuta M, Tawata S. Antiatherogenic properties of acetone extract of Alpinia zerumbet seeds. Molecules 2012;17:6237-48. Chompoo J, Upadhyay A, Kishimoto W, Makise T, Tawata S. Advanced glycation end products inhibitors from Alpinia zerumbet rhizomes. Food Chem 2011;129:709-15. Taira N, Nguyen BC, Tawata S. Hair growth promoting and anticancer effects of p21-activated kinase 1 (PAK1) inhibitors isolated from different parts of Alpinia zerumbet. Molecules 2017;22. pii: E132. Nguyen BC, Taira N, Tawata S. Several herbal compounds in Okinawa plants directly inhibit the oncogenic/aging kinase PAK1. Drug Discov Ther 2014;8:238-44. Nguyen BC, Taira N, Maruta H, Tawata S. Artepillin C and other herbal PAK1-blockers: Effects on hair cell proliferation and related PAK1-dependent biological function in cell culture. Phytother Res 2016;30:120-7. Upadhyay A, Chompoo J, Kishimoto W, Makise T, Tawata S. HIV-1 integrase and neuraminidase inhibitors from Alpinia zerumbet. J Agric Food Chem 2011;59:2857-62. Fujita T, Nishimura H, Kaburagi K, Mizutani J. Plant growth inhibiting α-pyrones from Alpinia speciosa. Phytochem 1994;36:23-7. Kim SY, Park JY, Park PS, Bang SH, Lee KM, Lee YR, et al. Flavonoid glycosides as acetylcholinesterase inhibitors from the whole plants of Persicaria thunbergii. Nat Prod Sci 2014;20:191-5. Ha YM, Chung SW, Song S, Lee H, Suh H, Chung HY, et al. 4-(6-hydroxy-2-naphthyl)-1,3-bezendiol: A potent, new tyrosinase inhibitor. Biol Pharm Bull 2007;30:1711-5. Osman NI, Sidik NJ, Awal A, Adam NA, Rezali NI. 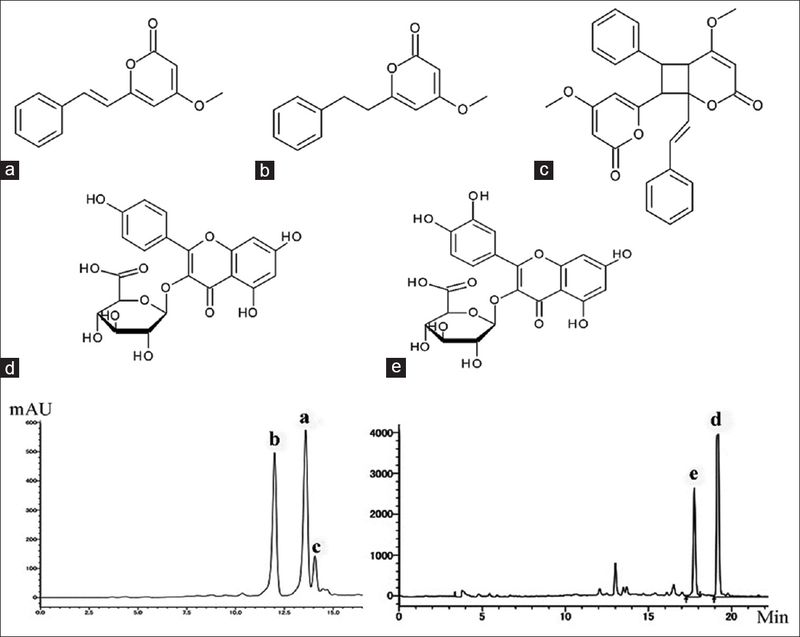 In vitro xanthine oxidase and albumin denaturation inhibition assay of Barringtonia racemosa L. And total phenolic content analysis for potential anti-inflammatory use in gouty arthritis. J Intercult Ethnopharmacol 2016;5:343-9. Govindappa M, Channabasava R, Sowmya DV, Meenakshi J, Shreevidya MR, Lavanya A, et al. Phytochemical screening, antimicrobial and in vitro anti-inflammatory activity of endophytic extracts from Loranthus sp. Pharmacogn J 2011;3:82-90. Solis PN, Wright CW, Anderson MM, Gupta MP, Phillipson JD. A microwell cytotoxicity assay using Artemia salina (brine shrimp). Planta Med 1993;59:250-2. Chatterjee P, Chandra S, Dey P, Bhattacharya S. Evaluation of anti-inflammatory effects of green tea and black tea: A comparative in vitro study. J Adv Pharm Technol Res 2012;3:136-8. Rauf A, Khan R, Khan H, Tokuda H. Cytotoxic, antitumour-promoting and inhibition of protein denaturation effects of flavonoids, isolated from Potentilla evestita Th. Wolf. Nat Prod Res 2015;29:1775-8. Saso L, Valentini G, Casini ML, Grippa E, Gatto MT, Leone MG, et al. Inhibition of heat-induced denaturation of albumin by nonsteroidal antiinflammatory drugs (NSAIDs): Pharmacological implications. Arch Pharm Res 2001;24:150-8. Das SN, Chatterjee S. Long term toxicity study of ART-400. Indian Indg Med 1995;16:117-23. Coleman JW. Nitric oxide in immunity and inflammation. Int Immunopharmacol 2001;1:1397-406. Lee J, Yang G, Lee K, Lee MH, Eom JW, Ham I, et al. Anti-inflammatory effect of Prunus yedoensis through inhibition of nuclear factor-κB in macrophages. BMC Complement Altern Med 2013;13:92. Surh YJ, Chun KS, Cha HH, Han SS, Keum YS, Park KK, et al. Molecular mechanisms underlying chemopreventive activities of anti-inflammatory phytochemicals: Down-regulation of COX-2 and iNOS through suppression of NF-kappa B activation. Mutat Res 2001;480-481:243-68. Tamir S, Tannenbaum SR. The role of nitric oxide (NO.) in the carcinogenic process. Biochim Biophys Acta 1996;1288:F31-6. Kacem M, Simon G, Leschiera R, Misery L, ElFeki A, Lebonvallet N, et al. Antioxidant and anti-inflammatory effects of Ruta chalepensis L. Extracts on LPS-stimulated RAW 264.7 cells. In Vitro Cell Dev Biol Anim 2015;51:128-41. Kim M, Shin S, Lee JA, Park D, Lee J, Jung E, et al. Inhibition of melanogenesis by Gaillardia aristata flower extract. BMC Complement Altern Med 2015;15:449. Reuter S, Gupta SC, Chaturvedi MM, Aggarwal BB. Oxidative stress, inflammation, and cancer: How are they linked? Free Radic Biol Med 2010;49:1603-16. Campos PM, Horinouchi CD, Prudente Ada S, Cechinel-Filho V, Cabrini Dde A, Otuki MF, et al. Effect of a Garcinia gardneriana (Planchon and Triana) zappi hydroalcoholic extract on melanogenesis in B16F10 melanoma cells. J Ethnopharmacol 2013;148:199-204. Chan YY, Kim KH, Cheah SH. Inhibitory effects of sargassum polycystum on tyrosinase activity and melanin formation in B16F10 murine melanoma cells. J Ethnopharmacol 2011;137:1183-8. Wu C. An important player in brine shrimp lethality bioassay: The solvent. J Adv Pharm Technol Res 2014;5:57-8.